British Prime Minister Theresa May is set to lose her majority in the UK lower parliament, according to the final exit poll. May called the snap election to deliver a mandate going into negotiations over Britain's exit from the European Union, in a bid to give her an advantage in the discussions in Brussels. Theresa May called the election knowing she had a lead in the opinion polls, despite having previously saying she would not. However, she took the political advantage of the opposition Labour Party's fallout with its leader, Jeremy Corbyn, to gain what she described as a "mandate" to go to Brussels and fight for a "hard Brexit." The vote closed at 22:00 UK time, June 8, with exit polls showing she was due to win 314 seats, yet not secure enough to gain an overall majority in the House of Commons, with opinion polls previously showing the gap between her and Corbyn's Labour Party closing in recent weeks. Labour are predicted to gain 266 seats, with other parties making up the rest — leaving Theresa May short of a majority. ​May announced she would trigger Article 50 of the Treaty of Lisbon — formally beginning the process of leaving the EU — by the end of March 2017. 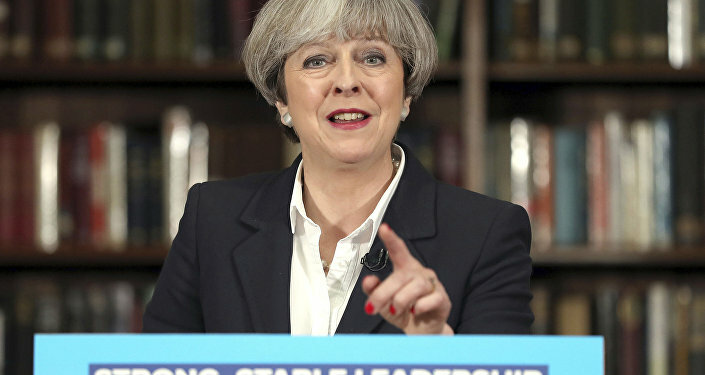 She said during her first few months in office that she would not call a general election that would give her a personal mandate as prime minister, having taken over as Conservative Party leader from David Cameron. However, she changed her mind and called an election, when she knew she would face no opposition from the Labour Party, the majority of whose MPs — largely opposed to its leader, Jeremy Corbyn — wanted an election precisely to lose it and depose Corbyn. As the votes come in overnight, June 8/9, May is watching to see if the polls are right, otherwise she will not be able to go into the Brexit negotiations with Brussels confident that she has secured her mandate for a hard Brexit.